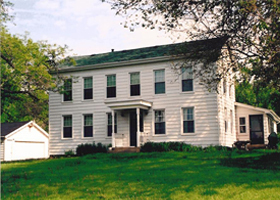 Aaron Friend and Joseph Brown established an outpost along Hickory Creek in 1829, making it one of the earliest settlements in Will County [Gougar Rd, north of Hickory Creek]. Along with Brown and Friend was a Col. Sayre who remained until 1832 when he built a sawmill about a half mile away in Joliet Township. After Brown died in 1830, Friend remained only a few years in the area, moving west with the Native Americans after the Blackhawk War of 1832. William Rice, Sr. and William Rice, Jr. came in 1830, began farming and built a log cabin [Gougar Rd., north of Hickory Creek]. In the fall of that same year they sold their land to John Gougar who purchased the land on behalf of his father William Gougar. The William Gougars stayed and eventually flourished. 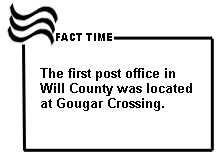 In 1832 Gougar established a post office at his farm. 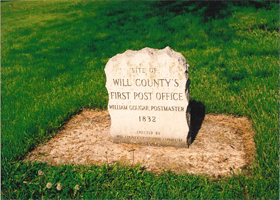 Residents in the area went to "Uncle Billy Gougar's" for mail. 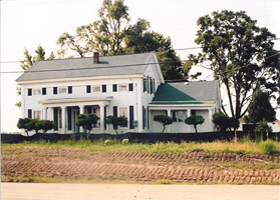 The Gougar farm became the center of activity in the area. The William Gougar house ca. 1844 still stands today. The monument is on the front lawn. Lewis Kercheval arrived in 1830 and led the farms established along Maple [U. S. 6, west of Clinton]. Other arrivals that same year included Samuel Russell, John I. Davidson, and Joseph Norman, who opened the second sawmill in 1833. Norman was also the father of the first child born in New Lenox Township, Elizabeth Norman in 1832. Abraham Francis came in 1831 [427 W. Francis Rd.]. Cornelius C. Van Horne became the first postmaster in 1832 and in 1833 the first school teacher. Joseph Reynolds settled in 1833. Other early arrivals included Michael and Jared Runyon, Isaac and Samuel Pence, Joseph, Alfred and James Johnson. Henry Higinbotham became a partner in Sayre's sawmill in 1834. Samuel Haven with sons Dwight, Carlos, Rush and Alvin established his farm in 1835 [U. S. 30, east of Schoolhouse Rd]. Isaac Hine came in 1836. Some of these came with wives and children; others married after arriving here. All came from the United States, most from Massachusetts, New York, New Jersey, and Pennsylvania. The first winter of 1830-1831 has often been referred to as the winter of the "Deep Snow." Not only were many early settlers unprepared for a severe winter because they had arrived late in the summer, but the first killing frost occurred in September and deep, deep snow and severe cold persisted throughout the winter. Most of the livestock was lost. However, a different kind of challenge faced the settlers soon after their arrival. Blackhawk, a Sac Indian chief, who repudiated an 1823 treaty which had ceded Indian lands in Illinois to the U. S. Government, returned to the disputed land with his followers who started planting corn. A peace representative was shot causing a brief war known as the Blackhawk War. Some wives and children were sent to area forts for protection, including Fort Dearborn in Chicago. Apparently a simple stockade was built near Gougar Crossing. The War begun in April was concluded by August, and the Native Americans were gone from the Township. The temporary stockade was torn down. The Van Duser farm (ca. 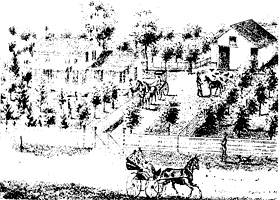 1840) from the 1873 atlas and the Van Duser-Handorf house today. Because William Gougar established a firm presence in the area [Gougar Road at Hickory Creek], the farm and its environs continued to be called Gougar Crossing for many years. The name Gougar lasted even longer on the school established there and the name continues today on the road. At various times settlers used the designation Van Horne's Point because C. C. VanHorne was the postmaster and schoolmaster there although it more commonly designated the area where the village of New Lenox was eventually located. VanHorne later moved to Joliet and became its first mayor. The post office was called the Young Hickory post office. In addition the area from the Des Plaines River to Hickory Creek was also known as Yankee Settlement, covering the much larger area from Lemont south to central New Lenox Township. The designation Hickory Creek Settlement was also used for the settlements along Hickory Creek in New Lenox Township. The "Old Brick Tavern" on the far east of the Township [U.S. 30 and Illinois Highway], built ca. 1842, served the travelers through the area. First it was a stagecoach stop and later any traveler could stop for the night and receive food, drink and a bed to sleep in. The building was unique because it was brick, not a common building material when wood was so common for other buildings in the area. The bricks were made with clay dug from the backyard of the inn. An unauthenicated story is told that Abraham Lincoln once stayed there when he was a young lawyer working for the Illinois Central Railroad. The tale continues that Lincoln stopped for the night and set out the next morning in a wagon to go to the Illinois Central stop much further east. However, the snow was too deep for the wagon, so the Lincoln group returned to the Old Brick Tavern for one more night.